Focus: items, collections, displays, emotion, time, space. With that start of the New Year we enter another year of collecting -- a year that is special in that since 1977, it’s only the 7th year in the 34 year history of Star Wars to see a new full length motion picture from the series hit the big screen. With every new movie comes a new wave of excitement in the hobby and new found interest in the franchise. That makes for an interesting scene for seasoned collectors and new collectors alike, as we see an influx of interest leading to some getting out of the hobby, some getting deeper into it, and of course new blood as well. For our second limelight review here on the SWCA blog, we follow suit on the original segment which covered a collector deeply entrenched in the hobby with nearly two decades of collecting under his belt. This time we have a pair of brothers who are equally vested in the hobby as a whole but with a very different approach to how they built their collection. This is the collection of Sean and Ryan Lehmkuhl, a pair of brothers from Cincinnati, who have an equally unique story behind their collection. Nostalgia is always a theme with collecting, however for our subjects this month they are unique in that they never saw the movies until after they had played with the toys as kids. That aspect of their collecting story struck me as the contextual aspect of the toys and the universe they lived in was unknown to them as children. Given that the toys came before the movies instead of vice versa, this and many others aspects of the “why, when and how they collect story” gives us a different perspective from the typical collector. So what is collecting in the "wild?" The term seems to have an increasing presence in recent collector discussions. Does it involve isolating oneself from others and going off on a spirit journey? Does it involve wild animals? Or, is it simply that they collect at the tail end of wild nights out on the town? At the end of the day collecting in the "wild" is quite simply collecting off the main grid and not utilizing the more common channels that collectors use today. In the early days of Star Wars toy collecting (1990s), the majority of purchases came through two means, mail order and brick and mortar toy/comic shops. Mail orders usually came via publications like Toy Shop with sellers such as The Earth or other shops across the country taking out ads with listings of their available inventory. Fast forward another 10 years and we have the internet being readily accessible to the majority of the population, giving birth to today’s mainstream channels for collectors. The big one, eBay, has remained the main source for collectors since the late 90s. Other channels such as forums (Rebelscum.com, and Imperial Gunnery) gave way to more direct access between collectors prior to Facebook coming around. Today these sites along with retail based web stores like Brianstoys.com make up the vast majority of all transactions in the Vintage collecting hobby. Collecting in the "wild" goes around all of these traditional and more accessible channels, and focuses on places more familiarly documented on shows like American Pickers and Toy Hunter. These include garage sales, attics, basements, and the occasional toy show. It’s a much more involved way of collecting, but it usually reaps larger rewards for those who are willing to invest the time into digging into these locations, and more importantly the time to find them in the first place. As adults today the Lehmkuhls' collection still resides in their parent’s basement, mainly for nostalgia and the fact that it belongs to both of them. Sean mentioned that the walls in the basement are covered with faux wood paneling. This adds to the nostalgia, and is something I can relate to as that’s exactly what covered the walls in my parent’s basement when I was growing up as well. As Sean and I started to discuss the collection, collecting in Cincinnati, how he and his brother started to collect, and their unique method of obtaining items, it was easy to see that this was going to be less about the what and more about the how and why of collecting. FP: What was your first interaction with the toy line? SL: A school that I attended had a lot of the toys. Kenner employees would donate the toys to the schools in the area including Star Wars, Ghostbusters and other Kenner lines from that time period. We hadn’t seen the movies at the time so we didn’t have a lot of context for the worlds the characters existed in and had to use our imaginations. We liked the characters so much that we went to see the movies, and that built on our love of the toy line. SL: I was 13, and my brother was 11 is when we started to collect loose figures. We picked up the majority of our collection in the early days at Traders World (flea market) right outside of Cincinnati; this is how a lot of prototypes got to the market. My parents were antiquers through the 70s so I spent a lot of time going to auctions and antique houses growing up. Thus the flea markets were familiar territory for me and I knew how to haggle from watching my parents. I saw my first display of plastic treasures there and was able to haggle with the seller on the getting a TIE Fighter Pilot for $3. From there we were hooked. A few weeks later we made our first big purchase: a Darth Vader case full of figures with their weapons. FP: What’s it like collecting in Cincinnati given it’s where Kenner was originally based? Has it impacted your ability to discover good finds? SL: Yes and no. There aren’t a lot of toy shows in the area -- this last year was the first one. It was a great event with 5 times what I saw at the Chicago at Kane County auctions. There’s a local company that runs the shows here as well as Dayton and Columbus. So that was the "no" part, but as Sean explained further and as you’ll see through the rest of the discussion the other side of this is a more resounding "yes." Think of it like being a Disney collector growing up in Anaheim, or being a Harley collector growing up in Milwaukee. Being in the key city where the licensee was headquartered gives you a strategic advantage in terms of the quantity per capita compared to other markets. You've also got a local network of people who worked for the company. If Kenner employed thousands of people in its heyday, with annual turnover there was an incredible amount of people that had a working relationship with the company in the Cincinnati metro area during the 1977-1985 run of the Star Wars toy line. This has a huge impact on access to items, specifically pre-production items. SL: Knowing the market is the key. Friends, family, and general connections are at the heart of being effective at picking up items. Random connections from others give you more leads. Another thing that really impacted the area around me was Toy Hunter; it made people in the town realize what some of this stuff was worth. It also made me and my brother take notice of the different opportunities to find a lot of great items in the Cincinnati area. FP: When did you start to collect? FP: What is your favorite figure and why? SL: Imperial Gunner. I remember playing with in pre-school. It came from a Kenner employee and was in a baggie. I don’t recall ever seeing a baggie version of Imperial Gunner so I’m not sure if this was meant for something or if it was a quality control item. On the newer acquisition side, it’s my roto-cast Yoda hand puppet mold. With Yoda it looks great because the metal gives it an additional level of detail. It’s the only one to pop up on the market that I’ve seen over the years. Like many collectors Sean and Ryan stopped collecting when Sean went to college. It’s a common occurrence as most in college don’t have the greatest level of discretionary income or the time to invest into a hobby like this. FP: What are some of your more recent acquisitions from the "wild" that stand out to you? SL: I bought 4 speeder bike (pedal bikes) in the last year. I always tell people to show up with money in hand so you can get what they have. I buy most everything in person and very little off of eBay and Facebook. I don't like the idea of flipping for trade bait, or buying single items for flipping, but bulk purchases are great to flip if you’re keeping some and getting rid of something. FP: Do you have a focus for the collection? SL: I don’t have a focus today necessarily; when we started it was to get a full loose run of figures. Then it changed to vehicles then it was keep one of everything that we find. Sean and Ryan’s collection is expansive, so Sean and I had a very lengthy chat on the collection itself, cutting it into segments and looking at some of the unique, rare and just impressive aspects of what makes it such a great collection in itself. However, one of the key things that I wanted to discuss with Sean was the Kenner coin section, how it came together, and of course the specifics of what it entails. As most know, the majority of these coins were released with figures in the Power of the Force, Ewoks and Droids lines towards the end of the Star Wars Kenner production run in 1985. There were 62 coins released, including those associated with the last 17 core Star Wars figures to be released. These are broken down into 5 categories based on rarity, with some being released exclusively through Kenner’s mail-in promotion. For more information on vintage Kenner Star Wars coins, see the Coins section of the Archive.) The collection itself spans every coin released in all three segments (Power of the Force, Droids and Ewoks) as well as some pre-production pieces. Needless to say there was a lot of chatter about this segment of his collection. SL: We have the full run of production coins as well as prototype example of nearly every Droids and Ewoks coins, (partly from a big find) but there were some we had to track down. When it comes to the silver POTF coins, my brother was the one who made the frame you see in the pictures. He has a knack for that sort of thing. FP: Let’s talk about some of the other aspects of the collection. Since we were somewhat on the topic of pre-production, why don’t you tell me about some of the other pre-production items in your collection. SL: There are a few pieces in the collection that stand out. We already talked about the roto-cast mold Yoda figure, but there are a few other pre-production items worth noting. There are a few first shots – AT-AT Driver, Hammerhead and Dengar. The Hammerhead figure came in a lot of figures that I picked up for $20 here locally. The unpainted Dengar came from a neighborhood friend who was the son of a Kenner employee; there were several pre-production pieces, half were painted and others were just one color like this one. In addition to his first shots there were a few other pre-production items worth mentioning. The first is a salesman sample of Ben Kenobi from the 12” release. Sean has recently had this piece graded and it’s a great piece of history from that series as there are so few pre-production era pieces in comparison to the 3¾” release. Lastly he has a pair of Gold Vader cases -- one with the black plastic interior and one with yellow plastic. As most know, these were used by the paint department to test out the gold paint that would be used on the C-3PO case that was eventually release in the ROTJ line. It's quite a feat to find one of these. To find a pair is impressive and like most of his collection these also came from the "wild." In the fraternity of long term Star Wars collectors and new collectors, pre-production is the key segment that has made the hobby exciting for many over the last 10+ years. 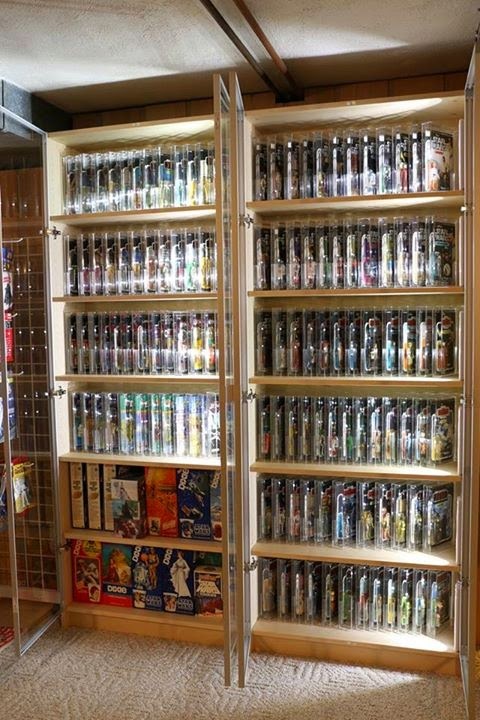 Let’s admit it, once you collect all 92, you want something more. Pre-production has a been a way that you can continue to introduce something new into the hobby in terms of physical content -- something that’s important when nothing has been made from the line in nearly 30 years. But for the uninitiated and the majority of collectors as a whole, the Kenner production line is still an area where people appreciate the accomplishments of their peers in terms of breadth and depth of collections amassed. This is no different for Sean and Ryan Lehmkuhl. Thus, as we closed out our discussion the topics turned more towards this part of their massive collection. FP: Your MOC collection is massive and displayed in a great way. Did you get everything graded? SL: Thanks, no everything is in AFA style cases we picked up when they had a sale a few years back. I really don’t get anything graded unless it’s pre-production. FP: What’s your goal with the MOC collection? SL: I would like to get one of every character on the card, and then get more focused the rookie cards for each character. There’s a lot still left to find with the ESB and POTF lines being the key focuses as we have the majority of the ROTJ and Star Wars lines. In addition to their carded figures, the brothers' collection spans into a full run of packaged and loose items. Some of the other key items include a full boxed run of 12” figures, several mailers including catalog multi-packs and stand alone figures, vehicles, playsets and something from every segment of the original Kenner line up. As many say, a picture is worth a thousand words so I’ll let the images do the talking when it comes to the expansiveness of items in pure volume. Let’s just say that it’s truly amazing to me that such a massive collection came primarily through non-traditional channels. Like many collectors, Sean does what he does out of a love of his childhood and rekindling memories, but unlike many he has found a unique way to build his collection -- one that bonds him with his brother and is something that should be acknowledged by collectors as a whole. Collecting in the "wild" isn’t easy, but reflects what is at the core of why so many of us are on this crazy journey to find our fix from a galaxy far, far away. I'm interested in contact you about the Star Wars figures you're selling on eBay. Please email me back at noelsilva@me.com. Noel (Corpodiagnostica).